OXFORD, Miss. – Two University of Mississippi professors have been honored for innovative research in their respective fields by being selected for fellowships in a competitive new National Science Foundation program. 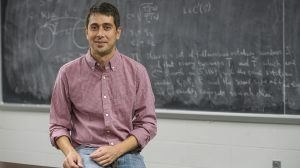 Ryan Garrick, assistant professor of biology, and Saša Kocić, assistant professor of mathematics, have been chosen for funding under NSF’s Established Program to Stimulate Competitive Research. The Research Infrastructure Improvement Track 4 program is designed to help junior investigators in EPSCoR-eligible states develop career-spanning collaborations through extended visits to other premiere research institutions around the nation. Garrick will conduct his fellowship at Ohio State University, while Kocić will visit the University of California at Irvine. Of 136 proposals considered by NSF in this competition, only 30 awards were made across 27 universities, for a funding rate of 22 percent. UM was among only three institutions receiving two fellowship awards in the competition. Both recipients said they were pleasantly surprised by their selection. “After many attempts to secure federal funding to support research and career development, during a time that appears to be a particularly difficult period for faculty doing basic research, finally having some success was a relief,” Garrick said. Chancellor Jeffrey Vitter congratulated Garrick and Kocić for their achievements. “We are so pleased to see the success of our researchers in this highly competitive program,” Vitter said. “Their tremendous achievements help drive discovery and creativity on our campus and enhance our undergraduate and graduate education. The awards reflect the promise shown by both researchers’ work, said Josh Gladden, interim vice chancellor for research and sponsored programs. “That the university received not just one, but two awards in this crowded competition is especially gratifying and shows that the National Science Foundation sees the same great potential that we do in the research careers of both Dr. Garrick and Dr. Kocić,” Gladden said. Each institution was allowed to submit only three applications. Garrick and Kocić each discussed the scope and goals of his particular research project. With $110,413 over the next two years, he will collaborate with colleagues at Ohio State to understand how the numbers and genetic variability of four invertebrate species found in southern Appalachian forests change as their environment changes. 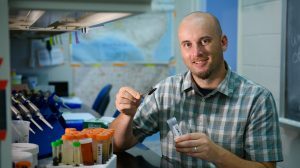 “This fellowship will enable research using genetic techniques to study how organisms have responded to past and present environmental change,” he said. “It will also generate new opportunities for sustained collaboration with the host institution. With his $161,681 two-year grant, he and a graduate student will initiate a new collaboration between the university and UC-Irvine, in particular with Svetlana Jitomirskaya, one of the top experts in dynamical systems and mathematical physics. The project will develop and apply state-of-the-art tools for studying dynamical systems, which will allow mathematicians to obtain new results by looking at systems at different spatial and time scales, revealing shared properties. There is a broad range of phenomena where these tools have led to an explanation. The transition between the liquid and gas phases – boiling and evaporation – is one familiar example. A particular focus of this project will be on sharp transitions and universality in two types of systems: relatively simple systems that underlie more complicated systems, and systems arising from quantum physics, Kocić said. “This project will lead to advancement of both areas, strengthen the research program in dynamical systems and mathematical physics at UM, and enhance its undergraduate and graduate education,” he said. Garrick’s fellowship is funded by NSF grant 1738817; Kocic’s by NSF grant 1738834. The mission of EPSCoR is to enhance research competitiveness of targeted jurisdictions – states, territories or commonwealths – by strengthening STEM capacity and capability. EPSCoR envisions its targeted jurisdictions as being recognized as strong contributors to the national and global STEM research enterprise.